In the living area of Daniel Rozensztroch’s Paris apartment, an Eames La Chaise and a butterfly chair complement a Moroccan Berber rug. As artistic director of Parisian shop Merci, Rozensztroch travels the world gathering objects. His 1,000-square-foot flat in the Marais district doubles as a personal museum of beloved possessions. A vintage console and a Noguchi floor lamp sit in front of an oxidized metal partition. A Smeg refrigerator is one of a series of red accents that punctuate the black-and-white space. Boffi faucets join sinks from Labour and Wait in the bathroom. A row of vintage iron cabinets, mostly recovered from doctors’ and dentists’ offices, separate the kitchen from the dining area. The Gervasoni table was designed by close friend Paola Navone. Architect Dominique Perrault and designer Gaëlle Lauriot-Prévost are responsible for the the tubular pendants over the dining table, which resemble old subway lamps. A vintage Eames rocking chair occupies a corner of the living room. In the bedroom, a 1930s painting by French artist Louis Parrens hangs above a vintage nightstand with a Lampe Gras light, designed in 1921 by Bernard-Albin Gras. The bed is dressed with Merci linens. Daniel Rozensztroch has a nose for real estate. The French designer and author moved into the Bastille District of Paris when it was a shabby, undesirable neighborhood. Today it’s a booming one. But after more than 30 years there, he felt that it was time for a change. His discerning eye lit on an architectural treasure—a 17th-century manufacturing plant in the Marais, a historic district that abuts the Bastille. The building, which housed a toy factory owned by Gustave Eiffel in the 19th century, was a rare gem that developers had purchased to turn it into apartments. Rozensztroch was smitten and decided to buy a raw space there. He’s far from naive about the ordeals of renovation—Rozensztroch was creative director of Marie Claire Maison, one of France’s leading home design magazines, for 25 years. Today (while he still consults for the publication), his time is mostly spent as artistic director of Merci, the trendsetting Parisian shop he helped conceive. He’s used to the pitfalls, problems, and surprises that inevitably arise during construction. But even with all his experience, he was not prepared for the many obstacles that awaited him. Because of the building’s rich history, it had been given the French equivalent of landmark status. It took more than three years to cut through all the red tape and bureaucracy before he could actually live there. The space, around 1,000 square feet, has double-height ceilings that make it feel open and inviting. A long wall of windows, covered with simple, semi-sheer cotton curtains, overlooks a grassy and serene inner courtyard. 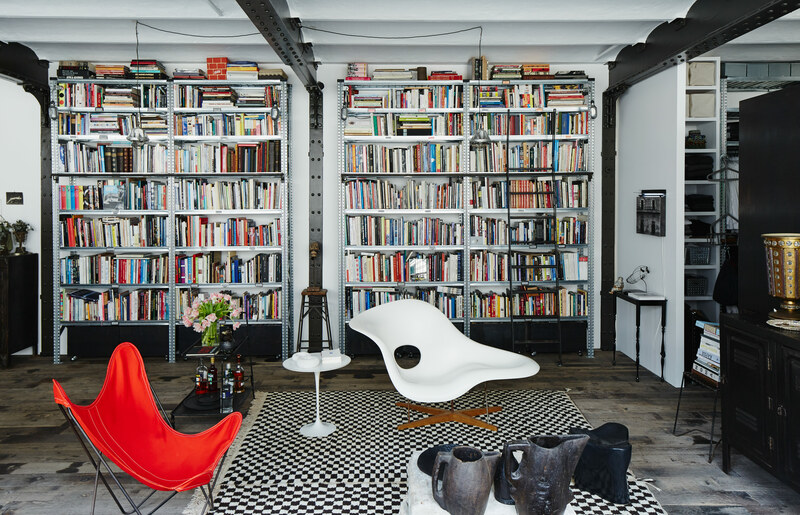 The wall opposite the windows is filled from floor to ceiling with industrial steel bookcases from Metalsistem that run virtually the complete length of the room. These are overflowing because Rozensztroch is an insatiable collector of what he describes as humble objects, about which he has written a series of books. The Everyday Things series is devoted to kitchen ceramics and glassware, wire objects, and vintage clothing hangers, and he has also curated several exhibitions of these simple wares. When he moved, he had to put everything into storage. After Rozensztroch had finally settled into his new home and opened the boxes, he was horrified to discover how vast his inventory was and staged a two-day garage sale. What remains is still more than most people could amass in a lifetime. The apartment has no dividing walls. Instead, working with architect Valérie Mazerat, the designer of Merci, he created three separate, distinct spaces. Vintage cabinets close off the kitchen; a single-height partition defines the living and work area; the bathroom and bedroom are behind this wall. The bedroom is the one space that is somewhat enclosed, providing a cozy retreat from the open loft. Because the old floors were beyond repair, Rozensztroch had them torn up, replacing them with vintage factory wood flooring imported from Belgium. Furnishings are simple. The living room sofa, designed by Paola Navone for Gervasoni, faces a Moroccan Berber rug, as does the dining table on the other side of the room, another Navone creation for Gervasoni, which is surrounded with vintage chairs. An array of objects, collected over a lifetime, add even more personality to the loft. Navone, a close friend and sometime collaborator who lives nearby, provided housing for Rozensztroch during his three years of apartment limbo. Because she travels so much, she was rarely there but was delighted to have a resident who kept the refrigerator filled. The kitchen is simply outfitted with up-to-date appliances—including an induction cooktop because the building deemed it too dangerous to install gas lines in the old walls. Vintage shelves from the 1950s by Mathieu Matégot provide additional storage on the wall over the sink and stove. While the Marais is a bustling neighborhood, also one that has become desirable for those shopping for real estate, Rozensztroch’s loft is well hidden from the busy streets. He enjoys what is almost a bucolic retreat, and he’s not likely to be moving again soon.